AERC NC Nuggets are Short Soundbites from the 2017 AERC National Championships! Even if you're not a mountain climber, you've probably heard of K2, the second highest mountain in the world, thrusting skyward on the China-Pakistan border. What K2 makes up for in height compared with its first-highest counterpart Mt. Everest is that it's considered the world's toughest 8000-meter peak to climb. That's why Samantha Browneller named her gelding Kaytwo, hoping he'd be the toughest horse around. He certainly was on the August 18th 50-mile AERC National Championship in La Veta, Colorado. The 6-year-old homebred bay Arabian (HV Suns Heaven and Earth X Royal Damsel, by Monarch AH), owned by Sami's mom Linda, finished first of 34 starters, in a time of 4:32.59, over the tough mountain course. Their nearest competitors were Cassidy Jaksch and Give Us a Kiss in second place in a ride time of 4:45.04, and Jennifer Poling aboard Eagle Baikal in third place, finishing in 4:45.06. Sami, 30, broke and trained Kaytwo, and started him in endurance last year. The gelding now has a 10 for 10 record (includes 3 LDs) with 355 miles, all finishes in the top 3, with 7 wins and 3 Best Condition awards. One of Kaytwo's wins - the ride just before the AERC NC - was the Spanish Peaks 50 on July 22 with Sami aboard, over some of the same trails as the AERC NC. Sami started riding endurance in 2000, and now has just over 1300 miles. "That's fast for this course!" said ride manager Tennessee Lane. "I'm happy for Sami; she was defending her home turf." 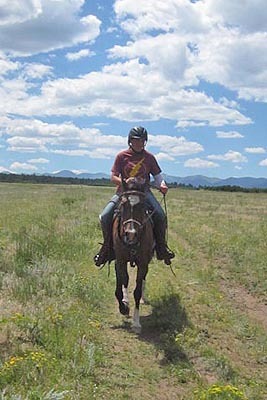 From Monument, Colorado, the Brownellers train their endurance horses over very similar terrain. Kaytwo digs this kind of tough, mountain trail, Sami said. "Put him up against any mountain, and he'll show how tough he is!" EDITOR’S NOTE: This is the first of two parts about an endurance horse’s recovery. Mike Maul, an endurance rider in Texas, has been campaigning a horse named Rroc (Rroco-My-Sol) for many years, with more than 11,000 career miles on endurance rides. At one point, however, this horse had a life-threatening emergency. That vet had a mobile practice and gave Rroc the standard medications. These didn’t help, so Maul took Rroc to the nearest vet clinic. That veterinarian worked on Rroc from 5 p.m. until 11 p.m.
AERC NC Nugget: Where in the World is Carter Hounsel? I arrive in La Veta on Wednesday before the AERC National Championships. Tennessee settles me in a rented house with the V.I.P.s, the non-local veterinarians. Jim Baldwin, from Oklahoma, is already there and settled in. Head vet Tom Currier, from Montana, should arrive with Carter Hounsel, from Virginia, around 1 AM. They're flying into Denver at night, hooking up there and driving Tennessee's jeep, that she left there for them, to La Veta, a 3 hour drive. 7 AM Thursday morning, my phone wakes me. It's Tennessee. "Seen Carter?" I shuffle out of my bedroom, and I see a bleary-eyed Tom, who says Carter wasn't in Denver, so Tom drove down alone. And Carter hasn't miraculously turned up on his own this morning. "Ah, the joys of being a ride manager," I comment. "My stomach hurts," Tennessee says. She comes to the house in the midst of a whirlwind of ride prep activity, and says she's tracked him down. She talks the airlines into telling her that Carter is on a little plane from Denver to Alamosa, an hour away. "Can you possibly go get him?" she asks. "If you leave in 5 minutes, you should arrive right about the time he lands." Sure, not a problem; one less unexpected time-consuming thing for a ride manager to do. I take the pretty drive over La Veta Pass to Alamosa, arriving as the 6 passengers are getting their bags. No Carter. I talk to the nice Tiny Airline guy, who says, "Well, he *might* be on the next plane, which leaves Denver at noon." I text Tennessee the news. Where the #$(& is that man?" She finally tracks him down, and he is on the next flight, and, after spending some long hours in Alamosa, where there really is not much to do, except walk through J.C. Penneys, and try the one coffee shop that has rather weak Americanos, I pick up Carter and zip him back to La Veta. He's been awake for over 24 hours, but he's still quite cheerful and humor-ful. It's a good group of veterinarians for this AERC National Championship ride. I was amazed Tom Currier even came to the ride - there's a fire raging right by his house. He evacuated all the animals and people from it and came down to vet this AERC NC ride. I'd be freaking out if that was my house. He shrugged. "Nothing I can do about it anyway." Tom's an endurance rider and endurance ride vet. Jim Baldwin's been around forever. He's got a story for every occasion, from recently to forever ago. He originally worked on the racetrack, and he was one of Secretariat's vets when he was racing. 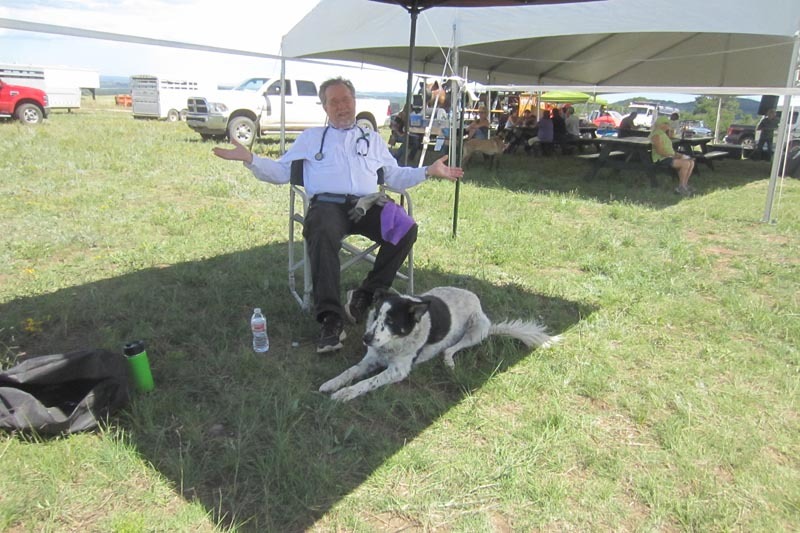 One of his goals is to be the oldest vet at Tevis, and he thinks he accomplished that this year. Many of you know Carter Hounsel as being from Texas, but now he's living in Virginia and is the emergency coordinator for 3 eastern states for the USDA. Carter's a good vet and a good teacher, and will explain anything you have questions about, if you want to learn. Local vets Laura Blanton (and her assistant Vanilla the golden retriever - or, as I liked to refer to her as, Vanilla Pudding - who could imitate a flying squirrel and a sharpei) and Miranda Andress rounded out the excellent vet team for the Championships. Good camaraderie, good laughs, good weekend. The Becky Grand Hart Desert Ride Series is pleased to announce 4 upcoming FEI rides in Southern California. Come experience some warm winter riding and no mud. Git R Done FEI 1*2*3* Nov 4, 2017 Inyokern, CA. Fire Up FEI 1*2*3* April 21-22, 2018 Ridgecrest, CA same location as Fire Mt with a faster 3* trail. The Shagya-Arabians entering The Tevis Cup Ride this year proved true to their heritage of a horse bred to master the rigors and versatility of a good cavalry horse. The Performance Shagya-Arabian Registry (PShR) congratulates their registered horses Lily Creek Kong, a Shagya-Arabian Sporthorse, ridden by Cameron Holzer and Ninja PFF, a Shagya-Arabian gelding, ridden by Shauna Glorioso on their Tevis completions as they placed 16th and 43rd out of 174 starters August 5-6, 2017. The Tevis Cup, a 100 mile endurance ride staged out of Auburn, CA, is considered one of the toughest rides in North America with an average completion rate of only 50%. Ninja PFF received special recognition this year as a recipient of the Wendell Robie Trophy. Named after the founder of the Tevis ride this honor is for any horse who has completed five times. Only a small group of elite horses have reached this status with 60 recognized since the beginning of the ride in 1955 according to Deborah Lyon with the Western States Trail Foundation. When asked about the ride Cameron Holzer, rider and owner of Lily Creek Kong, and Judith Moore, owner of Ninja PFF, both had glowing reports of how their horses handled the ride. Holzer stated that “Kong never tires, and just keeps trucking along. Every time I asked him for more speed he would give it to me. This is an inherent trait for him, he never gives up on me the whole 100 miles.” Moore had similar comments for Ninja PFF who “has a resting heart rate of 36 beats per minute, so he just breezes through the vet checks. Ninja makes a 100 mile ride look easy and keeps getting better every time.” That last statement is reinforced by the fact that despite a potential career ending stifle injury as a 5 year old Ninja has completed Tevis 5 times and currently has 2590 miles recorded in competitions. Moore said her proudest moment of the day was when Ninja was awarded the Wendell Robie Trophy and stated that it was “nice to have an award recognizing the horse” and that Ninja receiving it made her tear up a little. The Shagya-Arabian was started in 1789 when the Hungarian military set out to develop a new breed of horse that combined the very best of Bedouin Arabians -- elegance, endurance, hardiness, athleticism, temperament, and devotion to their rider -- with larger size, jumping ability, and riding ease to master the rigors and versatility of a cavalry horse. The Performance Shagya-Arabian Registry was established to ensure the integrity and legacy of the Shagya-Arabian bred horses in North America. To accomplish these goals the organization holds regular breed inspections and utilizes performance testing in compliance with internationally established criteria for all horses in the registry. For more information on the Performance Shagya-Arabian Registry and our horses please visit our website: http://performanceshagyaregistry.org. Hartland — Elite young equestrian rider Katelyn Baldino enjoys the endurance discipline more than any other, relishing the bond between herself and the horses through miles of natural terrain. For the upcoming FEI World Championships for Young Riders and Juniors, both Baldino and her horse will be traveling great lengths just to get to the 75-mile course. Baldino, a University of Georgia sophomore, and Synthetic, a 17-year-old Arabian gelding owned by Hartland rider Melody Blittersdorf, will be flying to Verona, Italy, for the world championships from Sept. 22-24. She calls this southwest corner of Colorado "God's Country." "You'll know why we call it God's country when you get here," AERC National Championship ride manager Tennessee Lane said. Indeed, the scenery and terrain of the 2017 AERC National Championships outside of La Veta, Colorado, are impressive. Los Cumbres Espanolos, the two 12,000 and 13,000-foot Spanish Peaks, tower above Ridecamp for the Spanish Peaks endurance rides and this year's AERC National Championships. 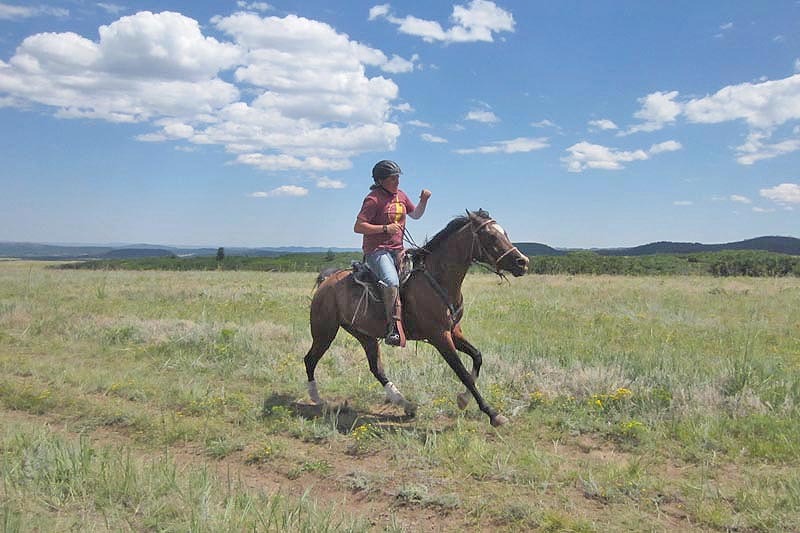 National Forest land covers the upper thousands of feet of the peaks, and ranchers own the lower graze-able mesas and grass lands, over which the entire 50-mile and 100-mile AERCNC rides took place, 130 miles of unrepeated trails. Tennessee had to bend over backwards to keep the ranchers happy to use these private trails - over 20 local ranchers allow Tennessee the use of their lands - and one can only ride these trails during her endurance rides. Tennessee's ridden some 9700 AERC endurance miles since 2006, but she only started hosting endurance rides in God's Country in 2016. Her SoCo Endurance was an ambitious project, putting on a tough mountainous 2-day ride in June and a 25/50/100 in September, and this year a 3-day ride in June and a 2-day in July. It was one of the reasons AERC approached her to put on this year's National Championships in August. Constricted by hunting dates (bow hunting season started a few days after the NC, and hunters were afraid the horses would scare the game off their game trails), August 18-20 was the only weekend Tennessee could host the National Championships. And the event happened to fall at a very busy time: two weeks after she rode in and won the Tevis Cup, which was 2 weeks after she put on her July ride. Talk about pressure. "Yeah I'm a little crazy," she said. "But… it should be easier than putting on multi-days rides with multi-distances, right? I'll catch up on my sleep in the winter." 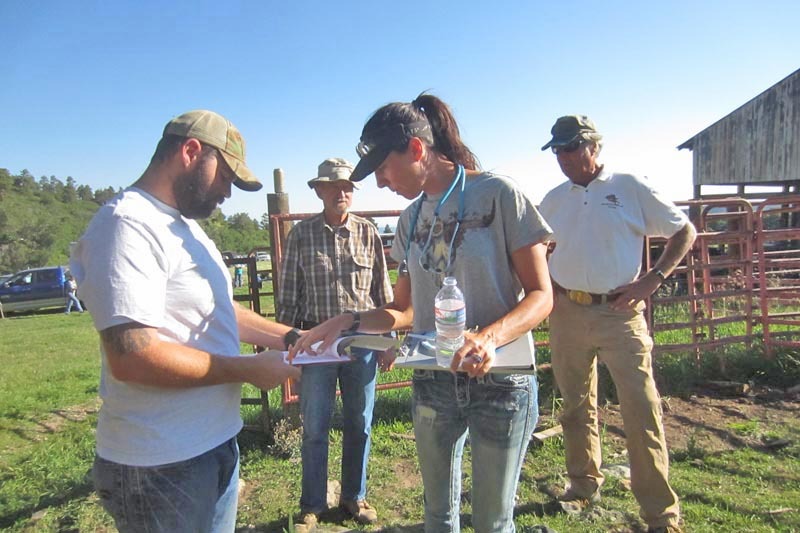 A microbiologist in a former life, Tennessee has returned to her ranching roots. 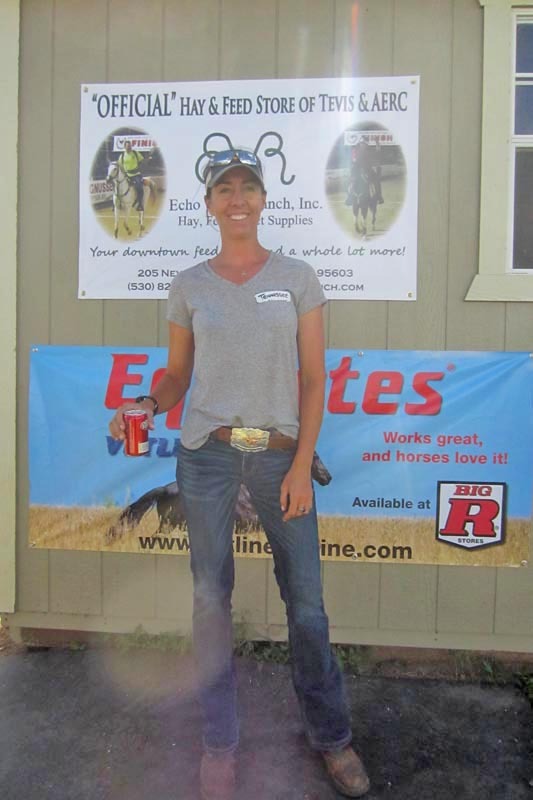 She manages the family's cattle land/leasing operation in the area, manages another family business, and owns and runs her own Remuda Run Ranch, where she breeds/trains/sells endurance horses, and offers endurance clinics, hoof boot consultation and services, and, of course puts on endurance rides. It's great country for endurance ride training. It's where Auli Farwa - Tennessee's mount for this year's Tevis - trained for a couple of months before the pair took the Tevis Cup win on August 5. "These endurance rides are a true representation of the Southern Colorado Rockies," Tennessee stated, "with miles of fast, flowing sections broken up by challenging, technical stretches and plenty of up and down. These rides have been thoughtfully designed to be very enjoyable and safe but also stimulating and demanding on endurance athletes both equine and human. They're tough, technical mountain endurance rides." It's great country for gasping and gawking, too. Riders and horses would experience the lower flanks of the western Spanish Peak, with vistas of the layers of Rocky Mountains to the West and the Colorado plains to the east, and they'd ride through one of the iconic rock walls that radiate out from the peaks. Altitudes for the National Championships would range from 7000 to 9000 feet. One particular loop would have a 1000 foot drop. "I ride up it to train," Tennessee said. "but I felt it was safer to take riders down the trail." 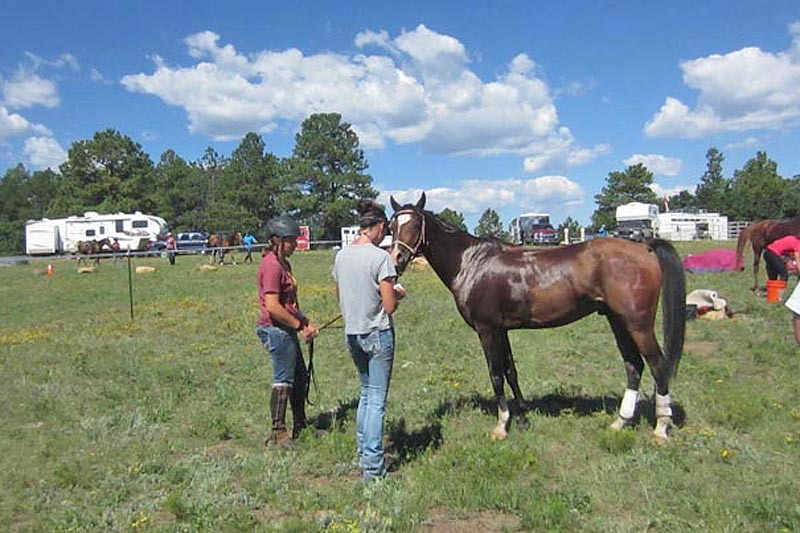 The National Championionships in God's Country below the Spanish Peaks would serve up scenery, fun, and a challenging endurance trail that tested a rider's horsemanship. Thank You to Our Distance Horse National Championship Sponsors! The Distance Horse National Championships (DHNC), including the AHA Distance Nationals, would not be possible without all of our sponsors! Our sponsors receive great exposure through Eblasts, the DHNC Program, links posted on our website and other industry advertisements. The great and unique thing about being a sponsor with the DHNC is increased industry exposure due to our efforts of partnering with outside breeds like the Appaloosa Horse Club and the Paso Fino Horse Association. We are still growing and will be adding more breed organizations in the years to come. Now is the time to show your support for Distance Riding. Click here to fill out a sponsorship form and add your Region, Club, business or farm to the growing list of sponsors of this national multi-breed event. THANK YOU to our current 2017 Distance Horse National Championship Sponsors! Local home-schooled student Lily Turaski has been awarded the prestigious Stamps President’s Scholarship to attend Georgia Tech. The scholarship covers the full cost of attendance for four years plus a stipend to be used for additional enrichment activities like study abroad. The scholarship is valued at over $200,000. The Stamps Foundation invests in 225 students who will attend 43 different universities nationwide. Stamps Scholars are chosen for their strong leadership potential, academic merit, strong work ethic, and exceptional character. At Georgia Tech, Lily plans to study materials science engineering, which combines her love of physics, chemistry and math. Turaski graduated with a 4.0 GPA as a Tennessee Scholar with distinction. She earned perfect scores on both the SAT and the ACT, and she is a National Merit Finalist. She represented Tennessee at the National Science Bowl three times, placing first in the nation in 2013 with her team in the engineering design document presentation. She placed in the top ten in the state three times in the Tennessee Mathematics Teacher’s Association (TMTA) High School Mathematics contest and first in the Southeast USA in the Student Math League contest. She was a national semifinalist in both the USABO Biology Olympiad and the USAChO Chemistry Olympiad. In 2015 Turaski was selected to attend the Governor’s School for the Sciences, where she was voted Ms. Governor’s School. Last winter she entered the Quantum Shorts international essay contest, where she won the People’s Choice prize among entries from 25 countries. Turaski placed first in the state in the 4-H Public Speaking extemporaneous division, and her 4-H Hippology team represented Tennessee at the Eastern National contest last year where the team placed seventh and Lily placed fifth individually. Turaski is a member of the Cedar Springs Homeschool Association, where she was the captain of her Scholars’ Bowl and Science Bowl teams and coached the middle school Science Bowl team. She has published several articles, including the results of a three-year science fair project about horse temperature regulation. She has also been awarded the National Merit Scholarship, the Anne Ayala Endurance Horse Racing Scholarship and a Coca-Cola Scholarship. “Who else would I want to spend all day with, besides my horse?” Michele Seaman said about why she loves endurance rides. Seaman and a group of dedicated friends want to build a community of endurance riders by restarting the Fort Meade Remount Endurance Ride, which took place for the second year on Saturday morning at the Fort Meade Recreational Area. Although the ride had taken place for many years under Kerry Greear, it languished after her retirement. With no one else willing to lead the charge, Seaman finally took up the reins. This year, 63 riders from six states turned out to test their horses and their skills in three different rides: a 50-miler, a 25-miler and an introductory 12-miler. The 50-mile race, broken into three legs with mandatory one-hour rest periods between, included a loop all the way to Bear Butte Lake. 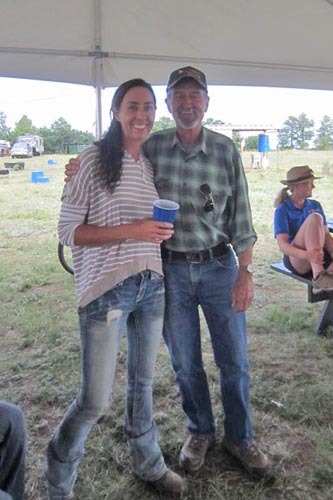 Saturday at the AERC National Championships in La Veta, Colorado, was a day of fun, relaxation, and prep for Sunday's 100-mile Championship. All day pig roast, fantastic musician/singer Bruce Hayes, an L.D. ride, getting ready for tomorrow's National Championship 100-mile ride. Pulse is 64 all day. Start time is 4:30 AM. Best Condition judging will be at 9:30 Monday morning. Last year's 100-mile Spanish Peaks ride was won in a ride time of 17:40. It's a true mountainous 100-mile ride! Updates will be posted (fingers crossed!!!!!) from each vet check. 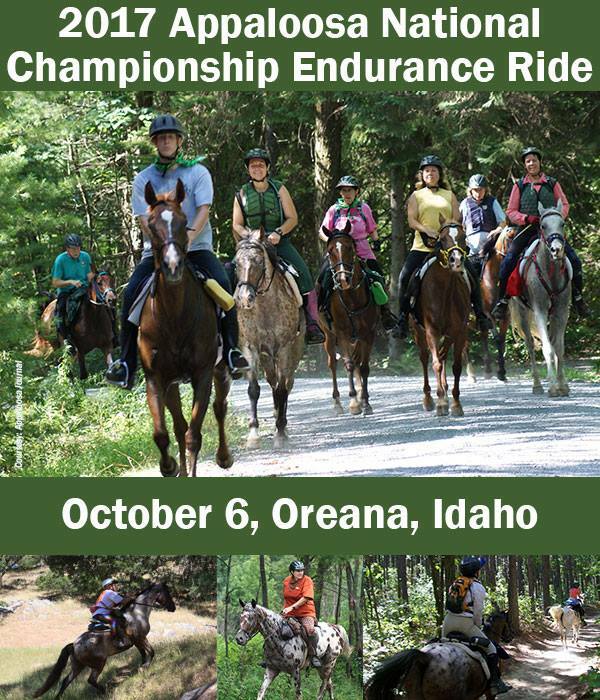 The Distance Horse National Championships is returning to Steph Teeter's Ranch this year in Oreana, Idaho from Oct. 6 to 8. We are very excited to have the Appaloosa Horse Club again this Fall, along with the Paso Fino Horse Association an additional partner. Make your plans now to attend the 2017 Distance Nationals in beautiful Oreana, Idaho! It is never too early to enter the National & Open Rides. To enter, please click here. 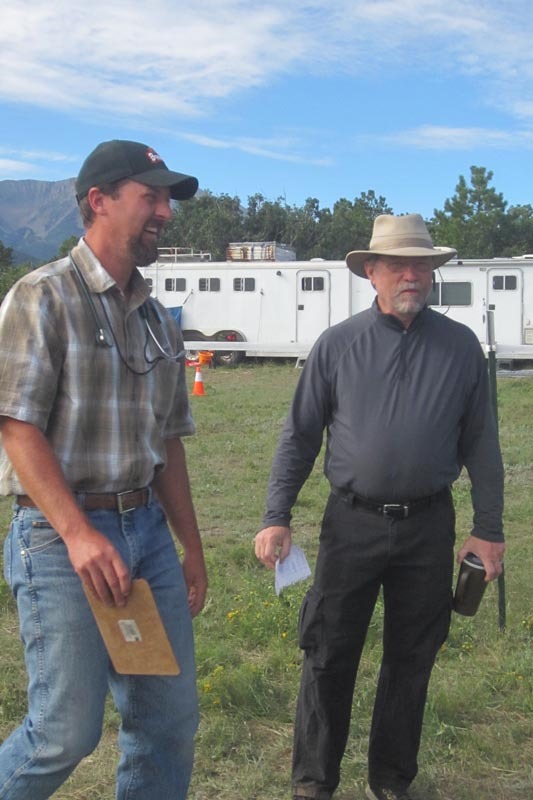 Local riders took 3 of the 4 top spots in the AERC National Championship 50 mile ride in La Veta, Colorado, on August 18, 2017. Sami Browneller, 30, of Monument, Colorado, and her mom's 6-year-old Arabian gelding Kaytwo won the 50 miler in a ride time of 4:32.59. Sami was also first Lightweight. 16-year-old Cassidy Jaksch, from Sedalia, Colorado, finished second aboard her 10-year-old Arabian gelding Give Us a Kiss in a ride time of 4:45.04. Third place Jennifer Poling and her 12-year-old Arabian gelding Eagle Baikal travelled to Colorado from West Virginia for the Championship. They finished in 4:45.06. Jennifer was first Featherweight. Fourth place went to Sami's mom Linda Browneller and her 18-year-old Arabian gelding Khaaruso in 4:51.06. Linda was first Middleweight. Fifth across the finish line was Jessica Woolery and WA Borkata, who was unfortunately pulled at the final vet check. Fifth place went to Cheryl Van Deusen of Dayton, Florida, riding Jeff Stuart's 10-year-old Arabian gelding DWA Malik, in a ride time of 5:14.30. This pair *just* nipped Canadian Elroy Karius and his 15-year-old Arabian gelding Jolly Holiday at the finish line. Seventh place went to Jeff Stuart of Utah and his 13-year-old Arabian gelding JV Remington in 5:14.33. Jeff was first Heavyweight. Eighth place was Bill Fuller and Emmie Lou in 5:14.40; ninth was Tammy Gagnon and Ginger Rogers in 5:26.15; tenth was Carla Lackenbrink, riding Christoph Schork's RR Jazz Dancer in 5:28.29. First and only Junior finisher was Taylor Fisher of Aurora, Colorado and Kenlyn Kourvy. Her sponsor was Steve Downs riding Kenlyn Porsche. Best Condition went to Jennifer Poling and Eagle Baikal. 31 out of 34 starters finished the ride. 4 open riders completed. Of the 3 pulls, 1 was a Rider Option, 1 was Metabolic, 1 was Lame. Starting tomorrow (Friday) at 7 AM, 35 riders will leave the starting line of the 50-mile ride near La Veta, Colorado. We have one Junior riding (Taylor Fisher). 4 of the riders are Open riders, who will start after the Championship riders (and will pick up Taylor anywhere along the way, if her sponsor can't continue). First loop is 17 miles, with an out vet check and hold of 1 hour, then a 15-mile loop back to camp for a 45 minute hold, then a final 18 mile loop back to camp for the finish. "It's a tough, technical trail," said ride manager Tennessee Lane. "You'll have some steep climbs and steep descents, and some places you'll be able to move out on. Go slow where you need to go, and move out where you can. "And have fun. We do this because we enjoy it." "Ride safe, ride smart," head veterinarian Tom Courier said. "This ride is in the true spirit of endurance. Take care of your horses." Ride Manager Tennessee Lane's got a lot on her plate right now. In case you didn't notice, she won Tevis less than 2 weeks ago. She's back in La Veta, Colorado, putting the finishing touches on this year's National Championships course. It's only her second year putting on rides, so what on earth would possess her to put on a National Championship? "Yeah," she said. "I'm a little crazy." But AERC actually approached her about putting on a challenging National Championship ride at this venue. Tennessee has created some 130 miles of trails, so nothing but the ins and outs of camp repeat, and it's all on private land. She's worked very hard with the local ranchers to get their permission to put on her rides over trails on their land. You can't ride these trails except at Tennessee's rides. 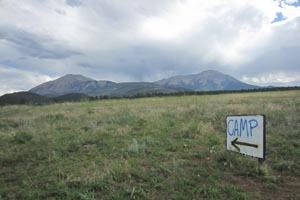 The trails are stunningly beautiful (the twin Spanish Peaks dominate the southern skyline); ridecamp is at 8,000 feet, and it will indeed be a challenging mountain trail. "This is a true representation of the southern Colorado Rockies and I don't intend to butter that up for you," her SoCoEndurance website says. There's plenty of diverse terrain, with climbs and descents and technical stretches to slow you down (so you can enjoy the magnificent scenery) and plenty of flat miles to cruise on. Currently there are about 20 signed up for the 100 mile ride on Sunday, and about 40 for the 50 on Friday. Endurance.net will be bringing you daily reports from the AERC National Championships in La Veta, Colorado, beginning this evening. The 50 mile championship is Friday (7 AM start time) and the 100 mile championship is Sunday (5 AM start time). Updates will be hopefully be posted during the day (depending on reception), and if not, definitely at night! Tune in for stories, photos and more! Rhonda and Dave Venable of Toano won the 47th annual Ride and Tie World Championship held July 22 in Orkney Springs, in Shenandoah County. Twenty-eight teams from across the country participated in the 35-mile race, which was held on the East Coast for the first time. Ride and Tie has a long history in the West, where it was first sponsored by Levi's in 1971. In eight years of competition, the Venables had won yearlong point championships three times, as well as the past two East Coast championships. However, this was their first world title. Rhonda Venable, a former cross-country coach at Bethel High, is a teacher at Crittenden Middle School in Newport News. She and husband Dave relocated from Yorktown to Toano in June, and trained at York River Park for the final six weeks leading to the event. 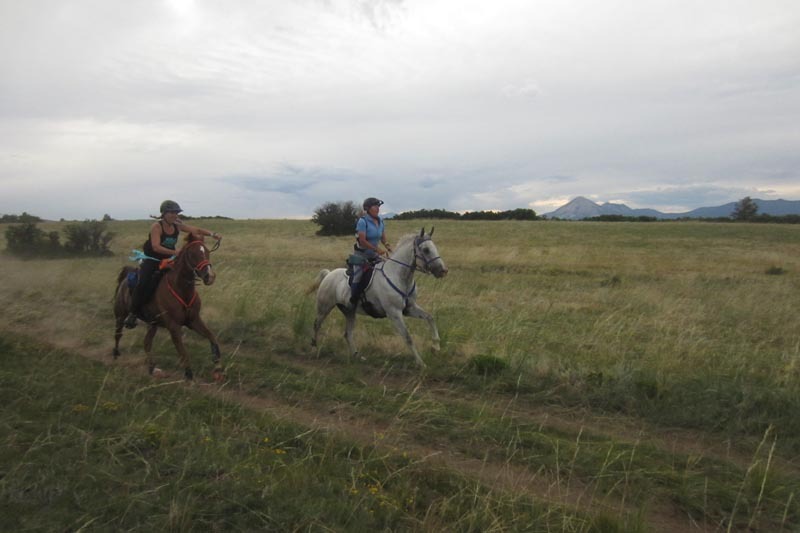 Participants alternate between endurance riding on horses and trail running on their own. Each team must get all three members (two humans and one horse) across the cross-country course by alternately riding and running. The Western States Trail Foundation has a loyal group of volunteers that will be working hard to bring you up to date information during the ride weekend. When the ride starts, there will be a link on the main website http://www.teviscup.org/ to the LIVE WEBCAST. That link will allow you to search the progress of a specific rider, information status by checkpoint, current leaders, and a list of pulled riders. New this year, you can even save a list of Favorites to make checking on their progress throughout the day more streamlined! Additionally, this year we have a totally new feature of optional live GPS tracking for riders! For $40 riders can elect to carry a live tracker, which will send pings to update the riders’ status on the trail every 5 minutes. There may be locations on the trail where GPS signal is too weak to successfully send a ping, the unit will try three times before waiting for the next 5 minute interval. You can follow along with those riders who have elected this service here: http://trackleaders.com/teviscup17 We’re also working to have individual riders GPS unit tracking linked to their “Where’s My Rider” webcast page. PLEASE CROSS POST AND FORWARD ON. Thank you.